Share your setup!!!!! SHOW US PICTURES!!!!! Hello. I thought we could all post our individual A/V setups in here. I'll start. 97 Coupe. JBL CS60.4 front output for the components, rear channels bridged to the 8" sub. All in all, it is decent sound for the sum of it's parts. I plan to upgrade each piece, piece by piece. Same head unit, Replace the Blaupunkts with JBL GTO507C Components, as they are 2 Ohm sets, and will maximize the output of the amp. JBL GTO301.1II Mono Amp, with a JBL P1022 10" Dual-Voice Coil Subwoofer, and a Custom enclosure. As soon as it warms up, I'll get pics, and update progress as it happens. Last edited by dohc5spd2dr on Tue Mar 06, 2007 6:52 pm, edited 7 times in total. Alpine head unit, nothing else. stkneon wrote: Alpine head unit, nothing else. Great setup for a cabin IMO ... i don't need anything advanced and i don't want anything advanced. and then i replaced the subs with 2 Kicker Solo-Baric L7's pushed with an Xtant 6.1. the real shame is that the subs and amps are just collecting dust in the garage. Old setup: top of the line (at the time) non-amplified Alpine head unit, JL Audio 6 3/4" Component sets with swivel mount dome tweeter in both doors, powered via a Pyle 360 DSM amplifier (old), three Rockford Fosgate 10" dual voice coil subwoofers powered by a Rockford Fosgate amplifier (model unknown; amplification and channel # unknown @ ?? Ohms). All stock speakers were removed. At the moment my subwoofers are in my closet and I'm preparing to remove the amplifier that powered them along with the wiring back to the other amplifier as I can't remove the other amplifier because it powers the head unit and component sets. New setup: Basically where it is at now because less weight is better and I grew out of the loud music phase. LOL. I was there before. I got rid of all the stereo stuff, and was all into the gut the car go fast! Now I am back to nice stereo stuff. Not the 1800watts and 2 12's, but nice and clean. Oh, I'm not gutting the car. Just putting it on a small diet. I still have all interior carpeting, dash and panels. I've only removed the rear seat, belts and some sound deadner so far. BCoN wrote: Oh, I'm not gutting the car. But My wife and I recentl bought a new 07 Camry SE V-6, and it has the Premium JBL stereo. The clarity is AMAZING. I got jealous, lol, and got my interest in stereo equipment back in action. Yeah, I think I am gonna keep my subwoofers and whatnot to stick in another vehicle when I get the $$$ for a beater. SQ is all it is about for me when I want to be in a comfy vehicle and that's what the old setup did best. 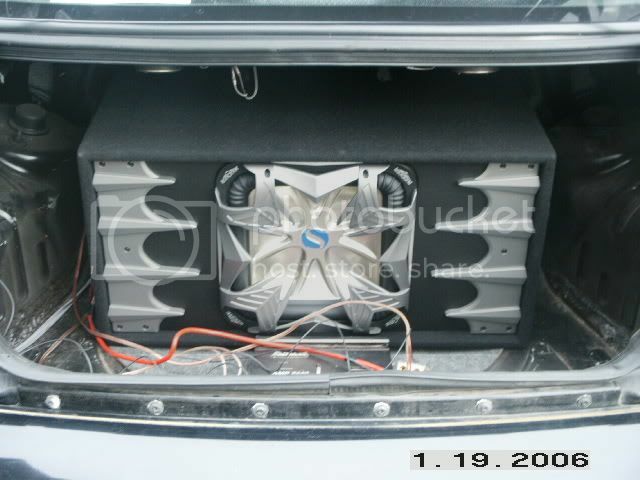 I here ya on the jealousy part, my dad has a 2,000 watt SQ(:lol:) system in his LH New Yorker. I can't remember all the specs but I'm confident in saying he has around $3k in the current setup. It's pretty wicked for a guy who is going on 50. BCoN wrote: Yeah, I think I am gonna keep my subwoofers and whatnot to stick in another vehicle when I get the $$$ for a beater. SQ is all it is about for me when I want to be in a comfy vehicle and that's what the old setup did best.